This is a how to on recentering H1 wheels. There are quite a few tutorials out there on this already, but since I'm building a set, figured I would post it here. 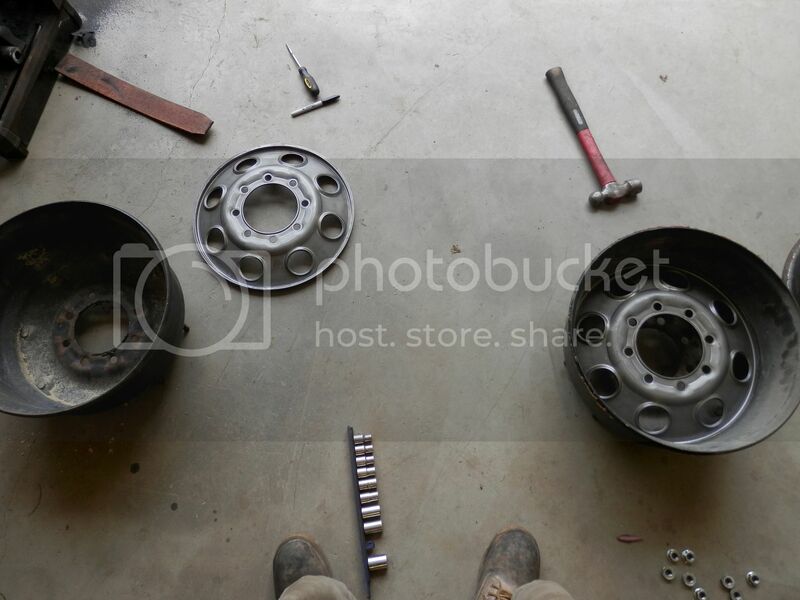 What I started with is a set of 5, 24bolt HMMWV wheels and tires. 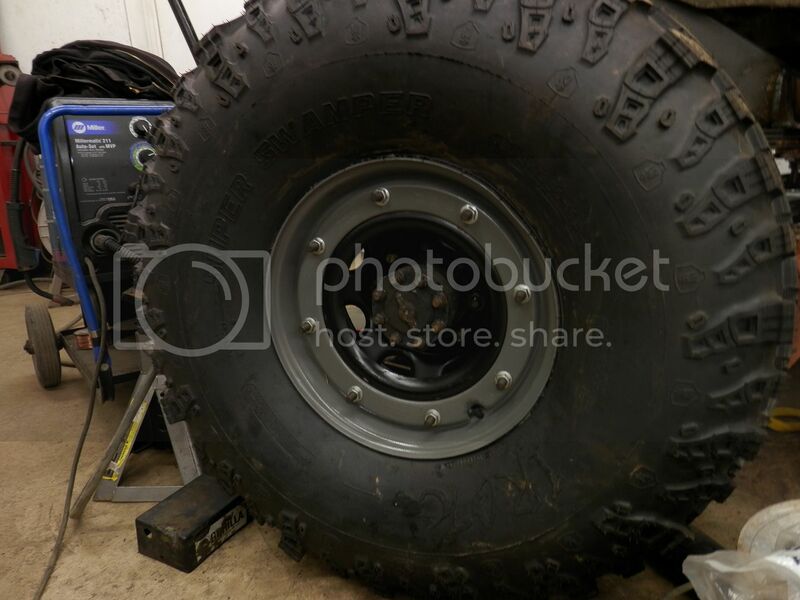 Tires are 37x12.5x16.5, and the wheels are 9.75" wide. 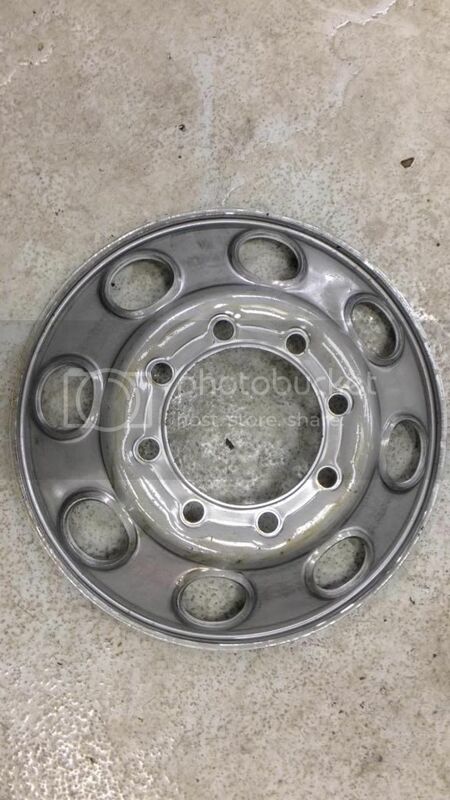 The backspacing on these wheels is around 7", and is too much for most vehicles. When these are finished the backspacing will be at 3.25". First thing to do is dismount the tires, never heat or weld on a wheel with the tire installed, it may explode from excessive pressure. 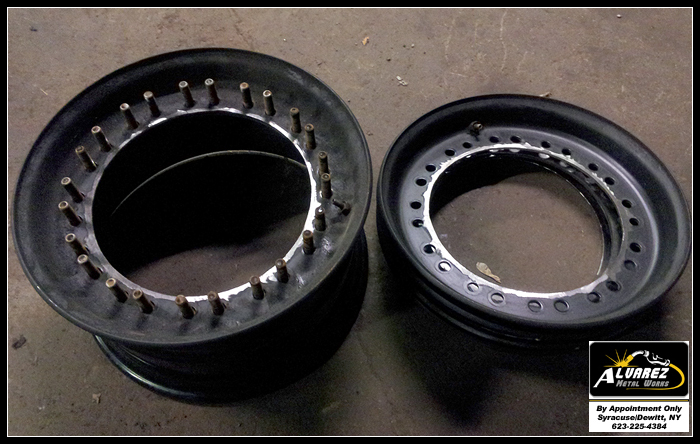 Here you can see the rubber insert that makes these wheels a double beadlock. Here is a view of how everything goes together. Next cut the original center out of the wheel. I tried doing this with a brake lathe, but it just chattered and generated too much heat. A regular lathe or jigsaw will work, but I had Rafael cut them out with his plasma cutter. The wheel centers are from C&M Performance Machine, and are the pressed in style. There are many different style centers out there, I chose these because they are one of the strongest and easy to install. 1/4" thick, it would be a challenge to bend one. These fit snugly up against the first step in the rear half of the wheel. The cleaned the paint off the rear half of the shell, ready for welding. Be careful when sanding or grinding this kind of paint. The military uses CARC on them, which can be harmful if inhaled. You said the back spacing will be 3.25" when finished. Their website says the maximum back spacing is 3.5" but you seem to be installing these as far into the wheel as they'll go. 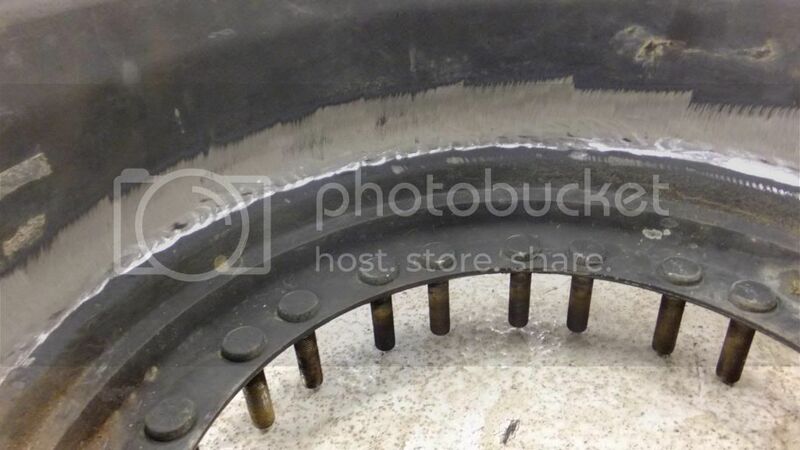 Is the lose of that extra 1/4" due to this being a 24 bolt wheel vs the 12 bolt wheel? Or is that a typo? I ask because I'm may in fact try and run these on my truck and trailer project but that 1/4" is a big deal on my truck. However thank you for posting where you got the wheel centers. That's a much better price than the typical H1 wheel supplier sells them for. I measured one just to see, and it was just over 3.25". There may be a slight difference between the 12 and 24 bolt wheels, the o-rings are different, so the shell probably is too. I dont have a 12 bolt here to compare it to. can't wait to see these when they're done! the centers kind of look like the stock chevy rims on some newer pickups. I wish your's were 6 lug so I could try them on lol. (12-04-2013 06:35 PM)yellowx16 Wrote: can't wait to see these when they're done! the centers kind of look like the stock chevy rims on some newer pickups. (12-04-2013 06:55 PM)AlvarezMetalWorks Wrote: I wish your's were 6 lug so I could try them on lol. The flat centers aren't as strong. 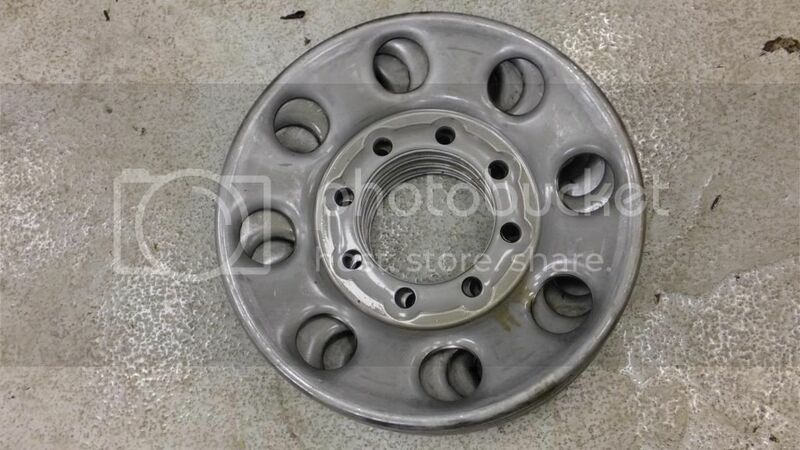 However how strong they are compared to typical cheap steel wheels is a question I haven't found the answer too. I think the flat centers weigh more too. The thing I like about them is that they have better drainage depending on their design. The pressed centers you have are said to be the strongest and the lightest but you are very limited on back spacing options. Quote: Flat centers are strong enough for any use. Over the past 5 years we have only had 2 people bend our flat centers. None of them have broken. The bend occurs in nasty roll overs or repeated abuse situations. 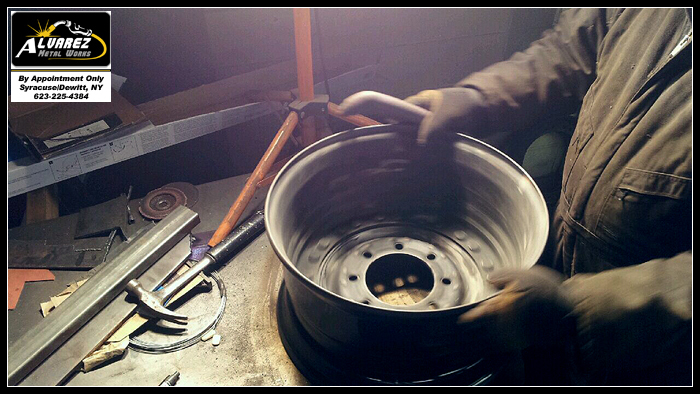 For instance, we built a set of wheels for a rockwell rig that consistently jumped his rig. He was a pregame show for monster trucks. The only time he has ever bent a center was from flopping all the weight onto one wheel. We built a replacement back shell for him and he was good to go. So they will provide enough strength to keep you going. Whether the flat center or pressed provides more strength is relative. To my knowledge, nobody has bent our pressed centers. The resulting force always gets transmitted into the wheel shell. Which causes problems. So looking at real world applications I would believe that the pressed centers do a better job of transmitting force around them versus absorbing them like the flat centers. I can't tell you much more than what I have experienced. However, I do not think you will have problems with them. I do like the pressed centers more because they are lighter weight than the flat centers when the wheel is completed. 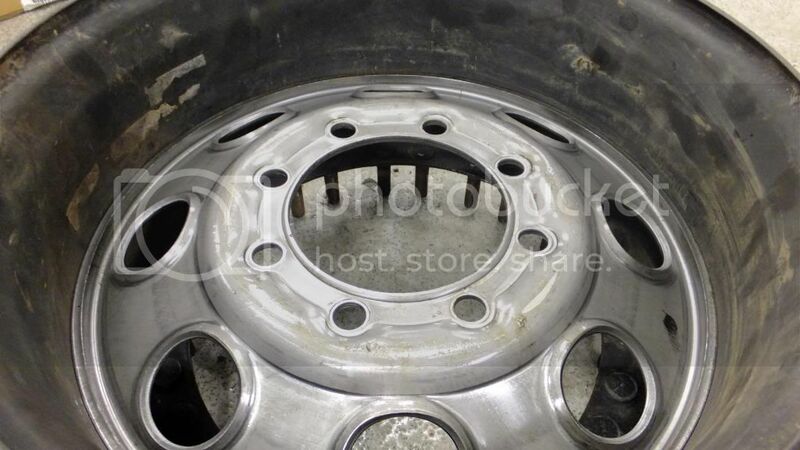 I can tell you that situations where we have had a wheel shell bent the same person has completely destroyed aluminum wheels. So I'm very confident that they will suit your needs. Great information. Thank you. I know they run those flat centers on those rock bouncer rigs so I assumed they were pretty strong but never found any information about. BUT, I am confused... 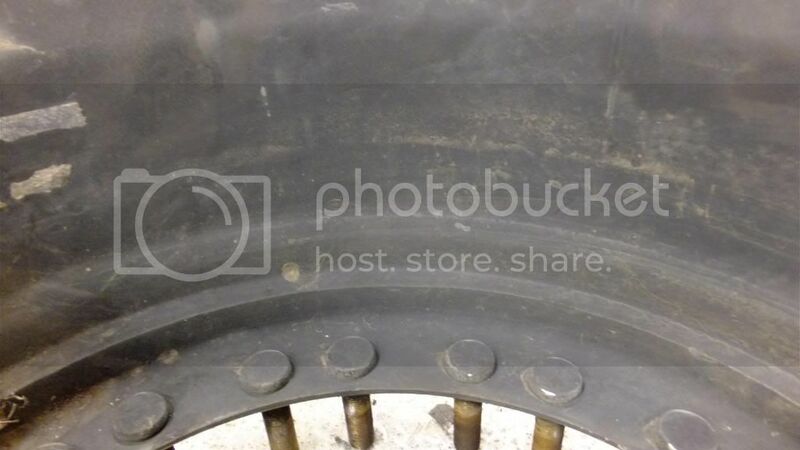 He just stated that his backspacing was 3.25", which means that his entire wheel will stick out a 1/4" farther than if he had 3.5" backspacing..... Do you not want your tires to stick out that far? If anything I think it would help with clearance! 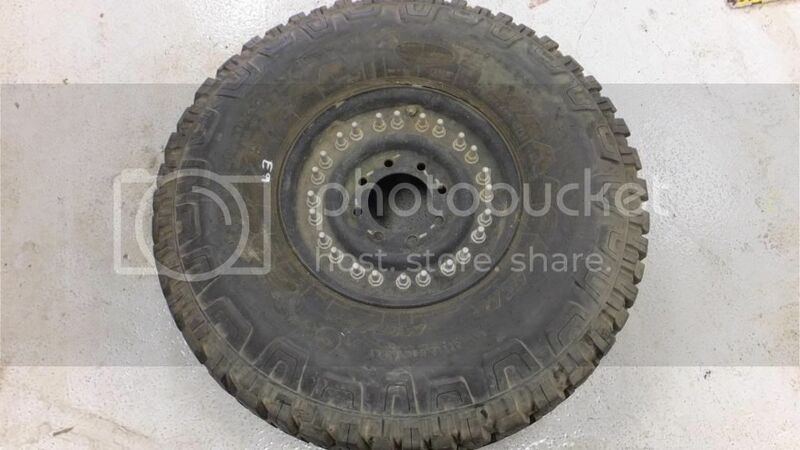 also, if your running these split rims, make sure you get lots of O-rings and keep them with you... For off-road rigs, its not a big deal, but on the road with smaller tires (Higher pressure) and summer road temps, they have been known to eventually leak here and there... 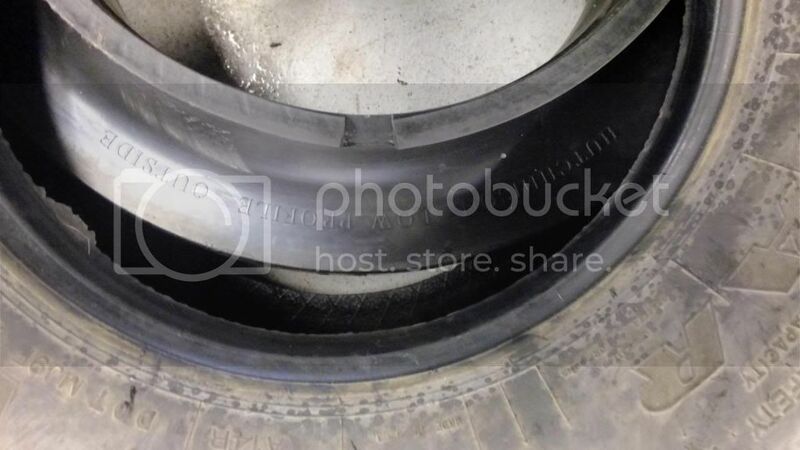 Always keep within the pressure rating on the rim and not the tire!